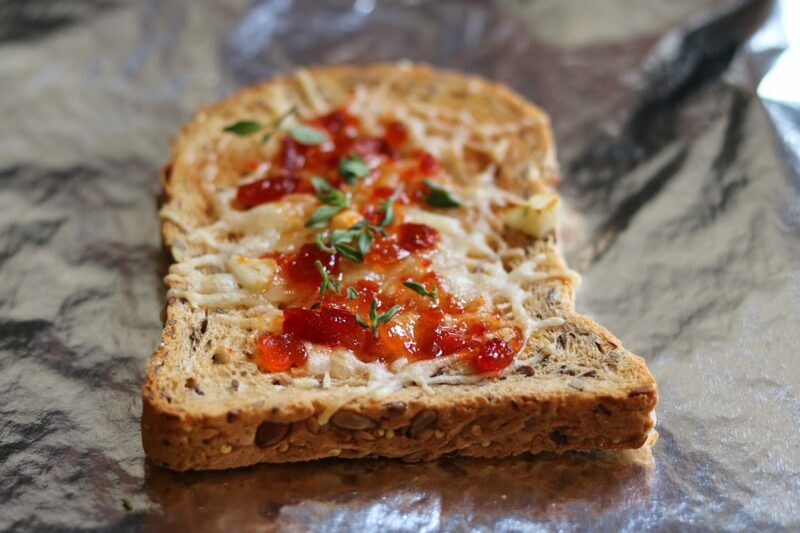 Everyone has their favourite way of making the humble cheese on toast and for me it has to be made with gruyere cheese, red chilli jam and garnished with thyme. I toast the bread first, butter it and layer it with grated gruyere cheese. I then season it with a little bit of salt and pepper and then place it on a foil lined baking tray for 4 minutes in a pre-heated oven at 200 degrees celsius. Once the cheese has melted, I spread chilli jam on top and garnish with thyme. It tastes amazing and is perfect for a quick meal or light lunch. My choice of chilli jam is the Tracklements Red Chilli Jam which is so delicious! I could eat it with a spoon but have to stop myself (after a few spoons). Tracklements kindly sent me lots of different condiments and sauces to try ranging from the classic tomato ketchup, mustard, rosemary jelly and of course the red chilli jam among others. This was my favourite and am so pleased to now have a full jar! What is your favourite way to eat cheese on toast?